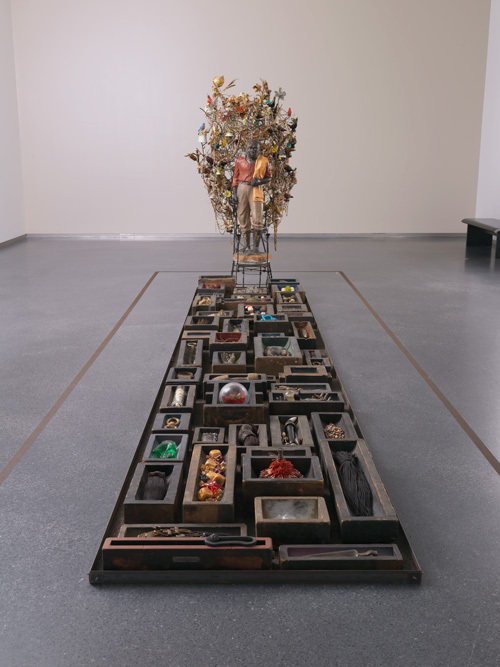 Property (2014), a mixed media sculpture by renowned American artist and Kansas City Art Institute alum Nick Cave, is on view through December in the Bloch Building Project Space at the Nelson-Atkins Museum of Art. Nelson-Atkins Museum of Art; courtesy of the artist and Jack Shainman Gallery, New York. Two years ago, the Nelson-Atkins Museum of Art acquired Property, a major work by Kansas City Art Institute graduate and world-renowned artist Nick Cave. On view for the first time in the Bloch Building Project Space, this recent addition to the collection is subtly provocative. The sculpture’s size — roughly 8 by 20 feet — is immediately impressive, but its contents —approximately 1,000 racially-infused objects and antiques, many culled from flea markets — are the real source of its power. The work’s intensity sneaks up on the viewer as its layered meanings slowly emerge. “The title Property recalls slavery as well as the lifecycle of things sold, used and discarded, then intentionally appropriated by the artist for creative transformation into socially responsive sculpture,” says Leesa Fanning, the museum’s curator of contemporary art. When I visited the gallery and saw this piece for the first time, my eyes went directly to the dominant figure, a black man with tattered clothing, a towel lying over his shoulders, and no shoes. His skin is dark as charcoal, and his face is calm, but somber. It is obvious he was meant to represent a slave, or a servant. Framing the figure, a nest-like construction of twine with beads and bird forms, is a chaotic, but beautiful addition. Birds are most commonly used as a symbol of freedom due to their ability to fly, in contrast with the male figure who may represent enslavement, or servitude, and therefore, cannot be free. At the foot of the male figure, a rectangular array of vintage mold boxes juts out across the floor. Within them are a variety of objects found at thrift shops and flea markets, some untouched, others embellished by Cave, as well as items fabricated by Cave. Each object was chosen to convey a message. The compartments also contain several molds of the artist’s hand, as well as perfume bottles and braided hair strands. Cave’s choice of items makes the past and present clash, creating a retrospective fusion between captivity and freedom; self-acceptance and dissent. “Nick Cave: Property” continues at The Nelson-Atkins Museum of Art, 4525 Oak St., through December. Hours are 10 a.m. to 5 p.m. Wednesday, Saturday, and Sunday; 10 a.m. to 9 p.m. Thursday and Friday. Admission is free. For more information, 816.751.1278, or www.nelson-atkins.org.